While your local pub may boast a great selection of ales and beers, it’s not until you release your taste buds into the the beer-verse outside the confines of your local watering hole that you realise that you have been unnecessarily restricting them. While it’s probably a tempting thought to go ahead and brew up your own concoction (here are the best home brew kits if you want to give it a go) there are plenty of beers readily available that certainly shouldn’t be ignored. If you’re looking to become a beer connoisseur, you’ll need a greater understanding of the differences between them all. Knowing your IPA from your dark beer and light beer from your lager is just the start, so we’ve given you a brief rundown of the differences below. For ales, the main difference is the colour – there are dark, malty, caramel ales, and lighter, fruiter ones, which are very drinkable, particularly in the summer months. 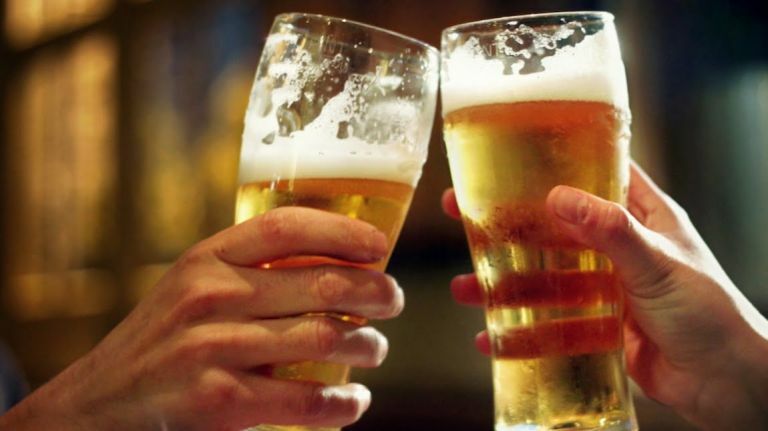 There are different types of lager, too; light lager, including American, German, German Pilsner and Czech Pilsner all have their own distinct flavours, with American lager typically being light in colour and flavour and Czech Pilsner being slightly bitter and hoppy. Dark lager is slightly more unusual, and takes on the bitter, hoppier flavours typically associated with ale. Moving away from popular ales and lagers, IPA and Stout are the next big names. IPA, short for India Pale Ale, is typically more floral and piney in flavour compared to regular light ales, and it’s also stronger in volume – so go steady if you’re looking to go east in your search for the best beers. Stout is about as dark as you can go and is recognised by its blackish colour and frothy head. For many, Guinness is the most popular and palatable stout, and comes under the Irish Dry Stout umbrella. Then there’s wheat beer, which, to no surprise, uses wheat as its malt, and Belgian beer, which usually takes on a spicier, sweeter and fruitier flavour. If we were to go any more into the depths of the world of beer, we’d have no time to head to the pub ourselves, so make sure you hit up a beer guide online if you’re still unsure on which beer path to take. Heading up our list of the best beers is St Austell Proper Job, which does, in all intents and purposes, a ‘proper job’ of pleasing your taste buds. We also feature a combination of dark and light ales and lagers, too, so all tongues are sufficiently tantalised. If you’re reading this list with the intention to do some proper beer tasting, make sure you invest in a decent beer glass set - the shape of your glass is incredibly important, especially if you’re looking to experience the wondrous flavours of your tipple of choice. So, without further waffle, let’s take a look at the best beers available to buy. St Austell have self-claimed their IPA as the forerunner of all modern IPAs in the UK. Taking the critical flavours that typically constitute an India Pale Ale and elevating them to a fruitier level, St Austell describe this beer as being packed full of citrus, pineapple and grapefruit flavours. As such, it should make a deeply refreshing drink and, for us, the perfect summer go-to. Having earned titles including Champion Premium Best Bitter and Champion Bottle Beer, there’s every reason why this IPA has clinched our number one spot. Originating from what is largely perceived as the oldest brewery in the world, Weihenstephaner Hefeweissbier is an award winning wheat beer distinguished by its hints of banana and yeast. It’s a light but full bodied beer, which pours as a white foam and should be drunk through the head to benefit from each layer of flavour. Light in colour, tasters say this beer is pretty filling, and with fish, seafood, spicy cheese and even a traditional bavarian veal sausage all recommended accompaniments, your favourite meals will never be the same again. Amber lager is completely different in flavour to light lagers; it’s usually maltier and hoppier with hints of caramel. Brooklyn have combined techniques from both British and Viennese brewing techniques to create a beer that is completely unique to the American market. As such, it should be the perfect accompaniment to American foods, including burgers, pizzas, and chicken, making it the ideal buy if you’re planning on having your mates round for a session. Made with just mineral water, locally grown hops and barley, this lager adheres to the German purity laws, which means you know exactly what’s in it. German Helles are typically maltier than traditional pilsners, but aren’t as hoppy, providing tasters with a refreshing drink that is best served very cold. Hofmeister has a lower carbonation than other light lagers, so it shouldn’t be as filling, making it the ideal easy-to-drink, pre-dinner refreshment after a tough day at work. If you’re looking to go off-piste, this unusual, oak matured Scottish red beer may be able to scratch that itch. Having been brewed in an oak barrel infused with rum, it takes on the distinct rum flavour for spicy notes, vanilla and rich fruit. With its warm flavours and full body, it’s the ideal winter drink, and if you’re worried about it being heavy, Innis & Gunn make a point of mentioning it’s surprisingly light flavour, making it a good all year-rounder if you happen to take a liking to it. Magic Rock Brewing have worked with newer hop varieties to bring a completely different style of beer to the table. It’s a blend of light ale and IPA, so it’s light and drinkable but maltier than a traditional IPA and fruitier than a traditional light ale. Brewed using six different hops, Inhaler has a fruity, ripe flavour which is completely void of bitterness. As such, it’s highly drinkable, at with a fairly low alcohol volume, you can afford to indulge in a couple of cans, too. If you’re looking for a beer to really tantalise those taste buds, you can’t get much better than the complexities of Belgian dark ale. With layers of plum, raisin and blackcurrant, this is a rich and fruity ale that should be sipped through its creamy head. With additional layers of malt and caramel, it’s the ideal accompaniment for dark meats, lending itself to beef or venison sauces, too.